SS-Sturmbannführer Ernst Lerch started adult life working in his father's cafe in Klagenfurt. A secret Austrian Nazi, when war came he served with the infamous Otto Globocnik in the purges of Jews in eastern Europe, being deeply implicated in the extermination programme. After the war, and whilst the British were occupying Kärnten, Lerch sneaked back to more or less openly run the family cafe. Oh, both the Brits and the Austrians tried to prosecute him, but not very hard. A charming schmaltzy character who presided lovingly over the Tanzcafe Lerch whilst tipsy British officers waltzed with dirndl-clad Mädchen. A loved and respected family man, he lived until Tony Blair formed his first government in the UK. A new play here, 'Tanzcafe Treblinka', explores the myriad issues around the astonishing tale of the man implicated in over a million murders. Franz Stangl, the commandant of Treblinka, was of course also Austrian. He was captured in 1970, and in the brief period between incarceration and death was interviewed at length by Gitta Sereny, whose book, Into That Darkness, remains one of the most profound and affecting books I have read. She believes that when he finally allowed himself to admit his guilt, the weight of his evildoing crushed him. His heart attack struck him 19 hours after the admission. When I search for common characteristics, common backgrounds, amongst these people, not monsters of horror but ordinary, dreary men - Arendt's 'Banality of Evil' - I find unquestioning conformity, a willingness to believe, respect for bureaucracy and hierarchy, trust in the establishment, unwillingness to voice contrary opinions, dogmatism and, yes, limited emotional intelligence. All the characteristics, in other words, that you and I spend our time on the interweb decrying, destroying and combating, whether we find them in individuals or institutions. Every illiberal bully who wants to ban and control thought and language, to restrict personal choice, to subvert democracy, to limit people's control over their own lives, to coerce and twist and emotionally blackmail, has the potential to grow into an Ernst Lerch or Franz Stangl if allowed enough oxygen. Our work in checking them can never be done. 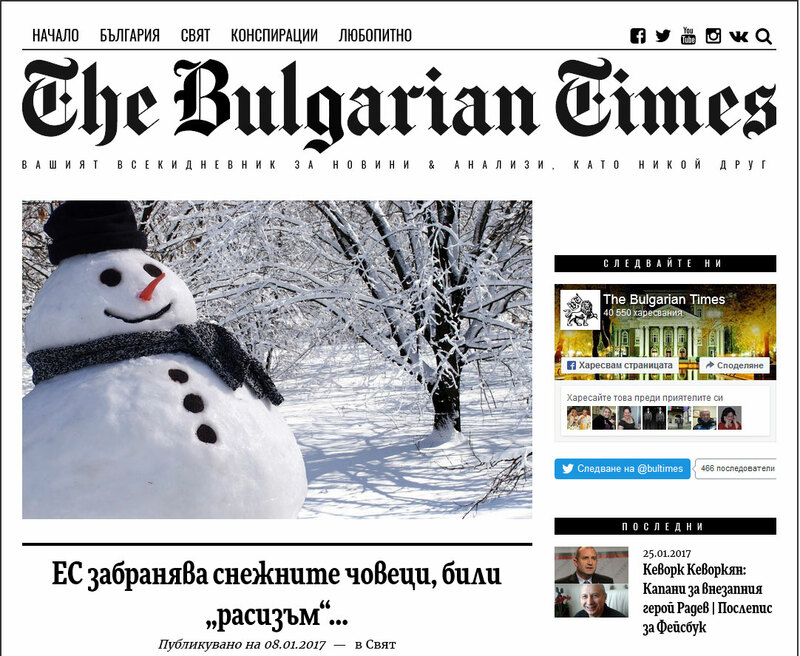 For non-readers of Cyrillic (including me) the headline in the Bulgarian Times claims that the EU intends to ban Snowmen as racist and sexist - unless they are non-white and recognisably female. 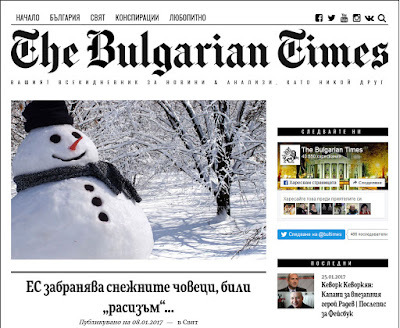 "The Commission merely reminded the Bulgarian government of the EU Public Actions Directive, which requires that European governments and local authorities undertake service provision in line with anti-discriminatory EU law. In this case, snowmen erected by government or local government staff, or erected in public parks, or on public highways, or military bases, or any land, locus or place on land or water owned or controlled by a governmental or quasi governmental organisation, must undergo a full Risk Assessment, be constructed in accordance with a written Method Statement, with any significant costs (e.g. for carrots or pieces of coal) submitted to the EU under the State Aid regulations, including the requirement for a 'Nil' return, and that each Snowman erection must be documented in an Equal Opportunities Achievement Statement. The erecting authority must demonstrate and publish electronically how the Snowman helps achieve the EU's aims in the Year of Organic Diversity of sustainable craft development and in imprinting the semiotics of diversity. So you will see this is no prohibition and there is no new legislation - the existing Directives, agreed democratically in secret by several commissioners democratically appointed by other commissioners - are quite adequate"
I'm going to skate over comments on the Brexit court decision yesterday; everything has already been said elsewhere. Suffice to say that Gina Miller is no angel but just a rather petulant, selfish rich woman used to applying wealth and sharp elbows to get her own way, and we will be glad in the end that Parliamentary sovereignty has been adjudged supreme. Despite my initial anger. Now for the hurdles in the Commons and particularly the Lords. Even though the government has offered to allow the Lords to "talk until they wet themselves", the place is unfortunately full of the corrupt, the venal, barrators, panderers, frauds, hypocrites, thieves and peculators and all the other rancid filth swimming in the festering ordure that is the output of the life peerage system. A vast number of these slime-coated denizens of the Eighth Malebolge owe greater allegiance to Brussels than to their sovereign. Which is exactly the reason I'm willing to allow my name to go forward to become one; if Mrs May has to pack the place with 'sunset peers' who are available to take up voting immediately, I'm happy to do my duty. The per diem and the decent bars and restaurants will more than make up for a few weeks of all night sittings, my bladder is strong and I'm both eloquent and erudite and used to speaking in such settings if required. And I won't mind if in February Mrs May then abolishes several hundred life peers from sitting, including me. I'm sure many regular readers are in a similar position. A regular luncheon table in the Lords licenced cafeteria made up of blog commentators would be rather fun. I'll bet that if I mention Carlill -v- Carbolic Smoke Ball Company at least half of you will get the reference. For any that don't, it's one of the first contract law cases that English professionals from all sectors learn when first at the teat of contract law & tort. I aced law, and kept up with it all through my professional career, through both the Times law reports and those in Estates Gazette. Over the years I've come not only to respect but to regard with a deep affection the wonderful, elegant and self-evolving way in which the corpus of civil law works in England and Wales. No other nation could have developed a separate, parallel stream of law such as Equity - a shield, not a sword - to use when the mainstream was lacking. And the Chancery barrister from whom I first learnt my law was equally in love with it all. My final act before I retired was to wholly resist a claim of £1m under NEC3 at adjudication with the law supplied by an eager young chap from one of the big city firms. I thoroughly enjoyed myself. There ain't nothing so elegant as a 300-item Scott schedule with our column totalling to zero. The Justice Secretary, Liz Truss, identifies one of them today in her summit with leading law firms. She promised to protect Britain’s status as the world’s biggest legal capital — a status which is worth some £25 billion a year. More importantly, it adds to the country’s historic reputation for probity, integrity and fair dealing. English contract law has evolved over centuries and it is used in contracts between individuals and countries which have little to do with England or the UK. Then there is the reputation for professionalism of the English legal profession and the independence and quality of the judiciary — however much the judges may occasionally irritate us. And if England is the centre of the legal world, London is the centre of the centre. Our justice system could of course be improved, notably the efficiency of the courts. But the Government is right to do what it can to safeguard the lawyers’ position. It should sign up to the Hague Convention on Choice of Court Agreements immediately after Brexit — it cannot do so while we are in the EU — and seek a replacement for Europe’s “Recast” rule. This is crucial. Let’s look to our strengths; right now we must make the most of them. "If the parties, one or more of whom is domiciled in a Member State, have agreed that a court or the courts of a Member State are to have jurisdiction to settle any disputes which have arisen or which may arise in connection with a particular legal relationship, that court or those courts shall have jurisdiction. Such jurisdiction shall be exclusive unless the parties have agreed otherwise." "If the parties, regardless of their domicile, have agreed that a court or the courts of a Member State are to have jurisdiction to settle any disputes which have arisen or which may arise in connection with a particular legal relationship, that court or those courts shall have jurisdiction, unless the agreement is null and void as to its substantive validity under the law of that Member State. Such jurisdiction shall be exclusive unless the parties have agreed otherwise."